Sometime back in the fall Rhonda Buss from Rhonda's Creative Life invited me to participate in Janet Prey's (of Islander Sewing) Get Your Motors Running contest. Ten bloggers would participate and the winner would receive the Islander MotorCity Express Jacket pattern and the Craftsy class that goes with it (awesome prize!). As the project wasn't due until February, I thought I would have plenty of time. You know where this is going, right? The holidays were busy then I had to catch up on client work and my classes started and I was suddenly surprised to find it was almost February. After a brief panic, I settled down to figuring things out. 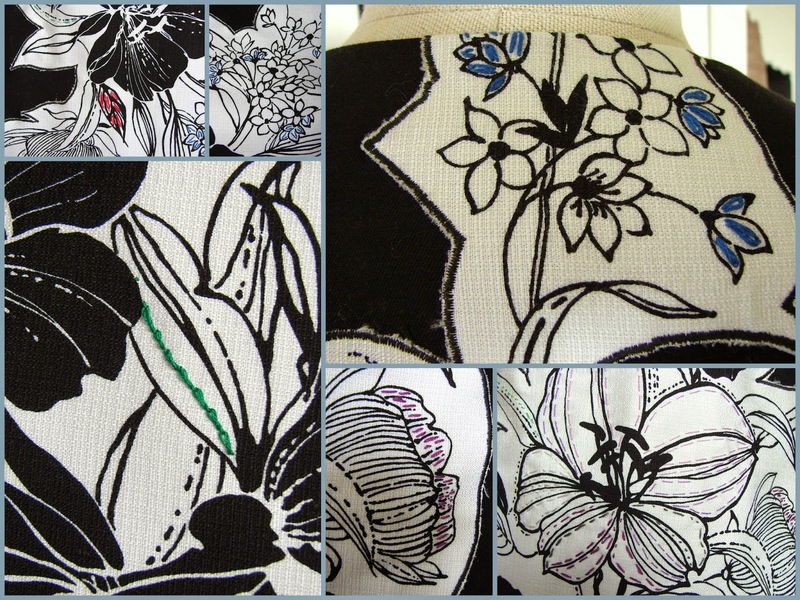 The challenge was to take a panel of fabric (white with black flowers) and . . . do something with it. This is where a good blogger would insert a photo of the fabric pre-cutting. You'll have to hop over to one of those good bloggers to see that. I can tell you that it was loooong (at least 5 feet) and narrow (approximately 24") and somewhat drapey. It really should have been made into a maxi-dress, but since I don't wear those, I had to think again. I'm really excited about making coats and jackets right now so even though this wasn't really the right fabric, I decided to do it anyway. I made a coat for a client last fall that had overlay panels of contrasting fabric and I generally had that in mind. Let me just admit right now that I really had no idea what I was doing with this project. No plan. I really just started working at it and it took me where it wanted to go, which was probably far far from my scissors at different points along the way. I really felt like I was channeling my inner Oona while I hacked and fussed and sometimes turned my back on the whole thing. Not sure the result lives up to her gorgeous creations, but it was fun to step away from rules for a while. I started with Butterick 5473, mainly because it is a very simple jacket pattern with very few seams. I made a muslin and made the following changes: lengthened bodice 1", lengthened sleeves 1", lengthened length 1", added shaping to the waist by curving in approximately 1.5" on each side. I didn't want a waist seam in my final jacket, so I used the muslin pieces as my pattern for cutting out the coat pieces without a seam. I'm sure this messed with the grainline, but it seemed to work. I also wanted the jacket to be lined, as I really don't have much patience for unlined jackets and coats. I simply cut out the same pieces, decreased the seam allowance to 1/4" for side seams and underarm to give myself more ease, and cut away the facing areas. This is probably all wrong, but again, it seemed to work! Now comes that fabric panel. I started by interfacing it with a lightweight woven interfacing to give it a bit more stability. I tried just using it as an overlay panel on the back of the jacket, but it didn't look right. So I sketched around the flowers to see what that shape looked like. Look close for sketch lines. I stitched on top of those lines and then drew around the sketched lines a second time. After saying a brief prayer, I cut the whole thing out. No turning back now! Now I had to figure out how to get it onto the coat. I experimented with some scraps, and finally settled on using a satin stitch to sew it down on the fabric using my earlier stitching lines, then cut away the excess fabric. I liked the fuzziness of the edges. After assembling the coat, I felt that it needed something to hold it closed. I thought about using a belt, but I didn't like how that cut through the design on the back. I took inspiration from a RTW jacket I own, and attached and over-sized hook and eye using black jean rivets. It's hard to see the black fabric, but I used this black cotton twill for the back and this stretch cotton metallasse for everything else. I purchased both of the fabrics and the lining from GorgeousFabrics.com. I love love love the metallasse and I'm happy to say I have enough left over for something else (short jacket? skirt?). I'm not entirely sure what I think of it. It's definitely a statement. I'm just not sure it's my statement. I'll need to wear it around a bit once Spring arrives (too cold now!) and see what I think. I did have a thoroughly excellent time making it and I learned a lot. Rhonda will be posting pictures of all the final projects on her blog Monday, February 2nd. I'm excited to see what everyone else did with their fabric! Click here if you'd like to vote (then just click on the heart in the upper right hand corner of the thumbnail to vote for your favorite). 22 comments on "Get Your Motors Running (Va-vvrrooooom!)" Very cool! I like the added embroidery. I could see this over a sheath dress for when you have to dress up. Thanks, Liza. I'll have to find some reasons to get dressed up! What a creative way to meet Rhonda's challenge! Beautiful coat! I like the additional embroidery you've added. Thanks, Ann. I'm even more excited to try an Alabama Chanin pattern now . . . Thanks, Tasha. I was blown away by the creativity of the other ladies in the contest. I think I want to steal Stacy's dress . . .
One of my favorites in the challenge. Good luck. So creative! I love the embroidery, and I love what you've done. Also the fastener is pretty cool. Nice job! Your design is great !! Love the way you managed to integrate the entire panel in the shelter, so creative. It's fun to know that there are people far away from each other wearing the same tissue around the world. Greetings, dear friend. And greetings to you, Rosy! I did want to try to use the entire panel in one piece as it was just so lovely. I do hope that the panels will cross paths agani at some point in some part of the world. Hi PoldaPop. Great use of the floral fabric. I was so happy to see the designs such talented women. I'm honor to be in the group of contestants. Everyone had such great designs and I can certainly draw from them all. Thanks, Cennetta. Congrats on your win - you did a lovely job! Thanks, Michelle! It was fun to have such a creative challenge. I'm glad to have found your website now! Thanks for the gush, Ky! I need to find something else to use this closure on - maybe a whole row of them would be cool.